Travel along the iconic Trans-Siberian Railway for a breathtaking non-stop voyage through three separate countries. This sixteen-day itinerary features the best of Russia, Mongolia and China. From the imposing, intricate and beautiful façades of Moscow’s architectural wonders to Mongolia’s vast Gobi Desert and the Great Wall of China, this journey will lead you through some of the most awe-inspiring landscapes and hotspots in the world. No reviews yet for this trip. Browse other reviews below for Nomadic Expeditions. 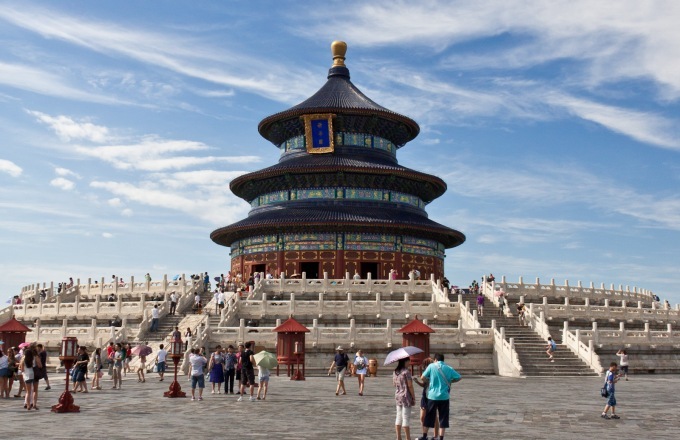 After a brief rest from your journey’s arrival in Beijing, enjoy tours in the Temple of Heaven and Tiananmen Square. The next day, travel to the Great Wall, stopping along the way to explore the legendary Ming Tombs, the Sacred Way boulevard of carved stone animals, and a pearl cultivation farm. Enjoy Peking duck in a famous Chinese themed restaurant. Take a guided tour of the former Emperor’s palaces in the Forbidden City, and then depart in the evening on your rail journey. Your Chinese train pulls out from the Beijing station and China’s busy rural life unfolds outside your window on this 16-hour journey through the countryside. In Erlian explore the colorful border market, and then travel through the vast expanse of the Gobi Desert to the green steppes of Mongolia. Arrive in the Mongolian capital of Ulaanbaatar in the morning, touring the Choijin Lama temple immediately afterward and enjoying a traditional Mongolian music performance in the evening. The next day, tour Gandan Monastery – the seat of Buddhist activity in Ulaanbaatar’s capital – and undertake an excursion to a mountainous area in the Mongolian Alps. A traditional demonstration of Mongolian horsemanship and a wrestling match follow, and in the evening you can sample some Mongolian cuisine. Pass through the valley of Selenga, the largest river in Mongolia, and join the main route of the Trans-Siberian Railroad in Ulan Ude. The next day enjoy a full day of activity in and around Lake Baikal, exploring the wonderful atmosphere of the lake and its picturesque town. Enjoy a short boat ride on the lake, and then move on to Irkutsk the following day. A tour of the city includes the lively market hall, drama theatre, and a newly-erected statue of the Tsar as well as an open-air museum displaying Siberian life in the old days. After breakfast travel through the landscapes of Eastern Siberia’s mountains, crystal-clear rivers and verdant slopes. Enjoy lectures, a social get-together with caviar and vodka, and lively conversation with your fellow passengers. The following day pull into the Novosibirsk station, Siberia’s largest city, and take a tour of the city on the mighty Ob River. The capital of the Ural Mountains and the border between Asia and Europe, Yekaterinburg, is the site of a varied and somewhat tragic history. The city tour includes the center, restored in 2009, and the newly-erected Cathedral-on-the-blood built in memorial of the last Tsar of Russia Nicholas II and his family. The next day arrive in Kazan, the old Tatar capital on the banks of the Volga, and take a guided tour of the Kremlin to learn about the bloody relations of the Tatars, Cossacks, and Russians. Before noon arrive in Moscow, Russia’s capital and one of the richest and most dynamic cities in the world. After your arrival and check-in to a first-class hotel, take a guided tour of one of the oldest Kremlin in the world and its glorious cathedrals. After dinner, take a special tour of the city’s lights and sights, including the Red Square. The following day take a guided tour of the reconstructed Cathedral of Christ the Savior, Lomonossov University and St. Basil’s Cathedral before departing for home.